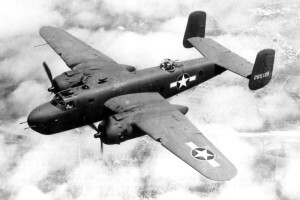 On August 9, 1970, a World War II B-25 Mitchel with a civilian registration was at Orange Airport in Orange, Massachusetts in preparation for delivery to a new owner in Rochester, New York. The pilot was making a series of five touch-and-go landings to test the aircraft prior to making the journey. On the second landing the aircraft suddenly veered to the left and cartwheeled onto the grass where it exploded and burned, killing the 36-year-old pilot. As the plane went out of control, it barely missed striking a bystander watching the landings. The pilot was identified as Roger N. Lopez, of Northfield, Massachusetts. Witnesses reported that the aircraft appeared to be having engine trouble as the pilot was attempting the second landing. Firefighters from several surrounding communities responded to the accident. One firefighter from Orange was slightly overcome by fumes.